Hickstead horse feeds, from ForFarmers Speciality Feeds, are delighted to be sponsoring North Lanarkshire based Declan Irvine. 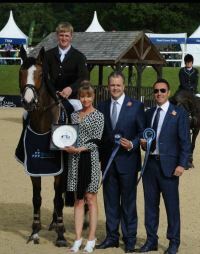 Declan Irvine, sponsored by Hickstead, seen pictured on his winning horse. Declan Irvine, 22, from Balloch, near Helensburgh, is benefitting off Hickstead Horse Feeds and is seeing significant improvement in the performance of his horse. Declan has experience working in Europe in Dressage Yards before returning home where he started working for Lanarkshire Based Horse Dealer Richard Duncan (RD Sport Horses). "I rode a range of horses with RD Sport Horses from cobs to potential and proven competition horses, no day was the same with horses regularly coming and going. I think this was my foundation and I learnt so much from riding all different types of horses. I hadn’t much showjumping experience previously apart from competing at my local pony club with my pony. I bought a horse when I was 13 and apart from getting a lift to shows with friends that was as far as it went. As I stuck in helping Richard with his dealing he bought me a horse to go out and compete and within a year I went from jumping at a few shows to competing in the A&B Classes at the Royal Highland Show. 2 and half years on I have 5 horses that I get to compete regularly with which are all for sale” comments Declan. In July Declan moved to his new yard in Glenboig near Airdrie and is settling in. He hopes to make a trip to one of the spring tours in the new year. "I am delighted and really looking forward to working with Hickstead horse feeds. Since we started using the Hickstead horse feed product range I have found a positive difference in each horse. We are sometimes away from home for a few days, it’s great that our horses do not lose any condition! We are also feeding Hickstead feeds to all our horses in the yard and have also seen a significant difference in the performance in these horses as well" adds Declan.